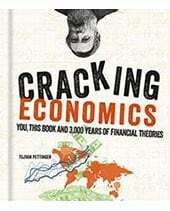 The unadjusted labour share is usually calculated as the ratio of total compensation of employees – wages and salaries before taxes, plus employers’ social contributions – over GDP (national product/income) (Luebker, 2007). 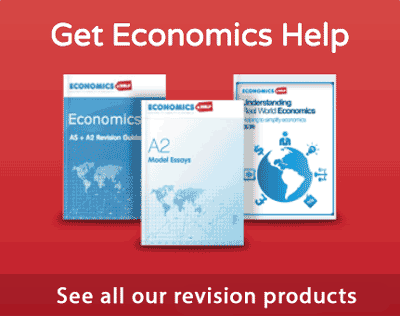 There are different methodologies for calculating labour share – e.g. should executive pay and share options be included? 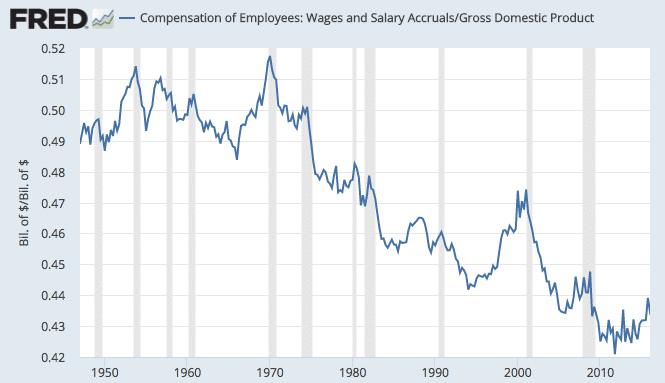 Greater insight would be gained by seeing median wages as a share of GDP or excluding the top 1% of income earners – who have seen rising income in recent years. 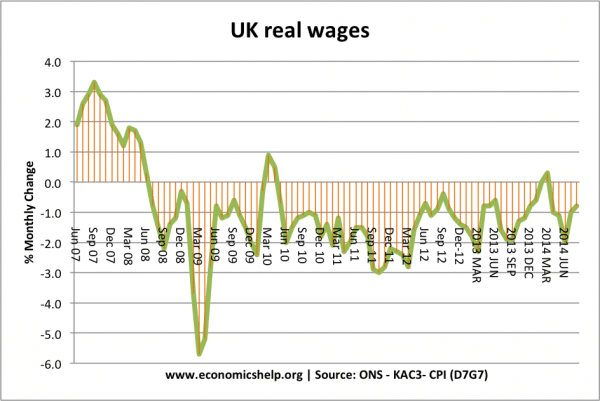 Nevertheless, even unadjusted labour shares give an idea about the relative distribution of income. 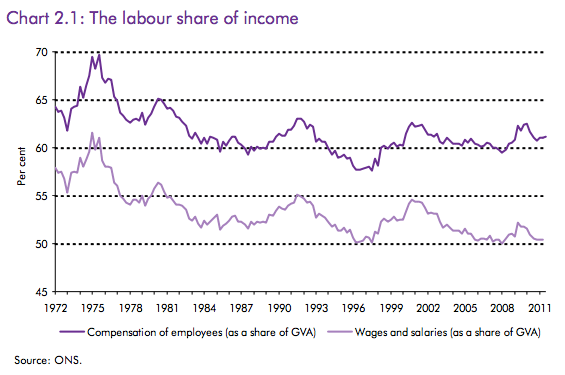 Labour share of income – wages and salaries are taking a smaller share of GDP. Profit and dividends are taking a bigger share of GDP. 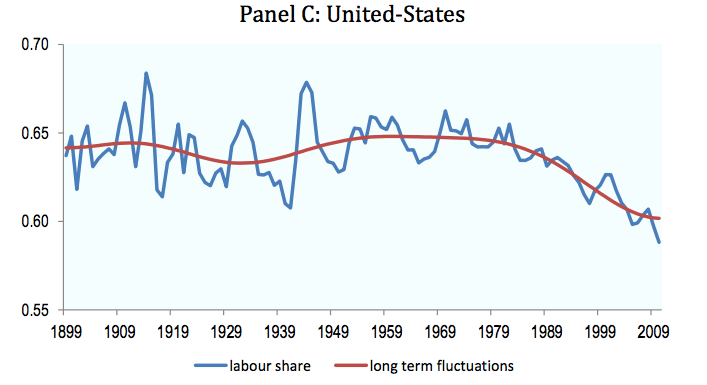 In the US, the labour share was quite consistent until the end of the 1970s, where it began to fall. 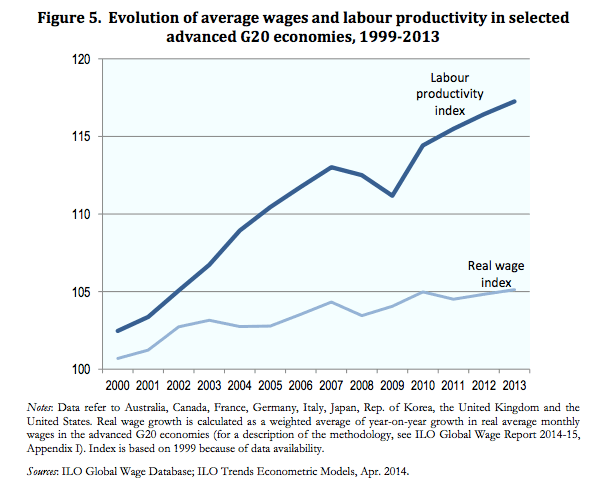 Labour productivity growing faster than real wages – implies falling share of GDP for wages and salaries. 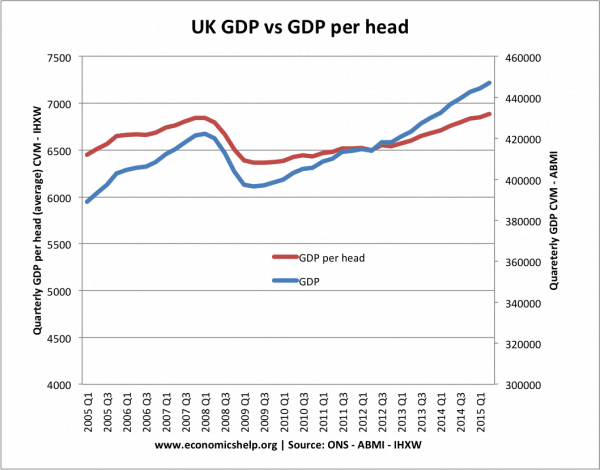 What could be causing falling labour share of GDP? 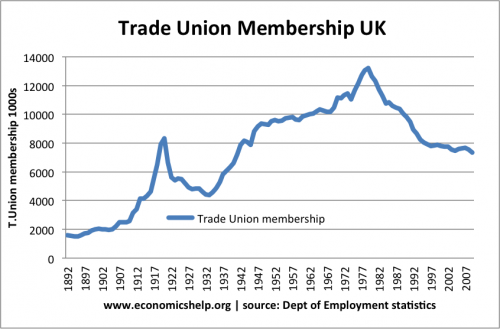 UK labour share peaked in mid-1970s, which was also the peak for trade union membership and trade union influence. 3. 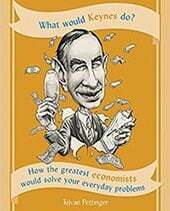 More flexible labour markets. The UK and US have seen a growth in labour market flexibility – more flexible contracts, zero hour contracts, part-time work. 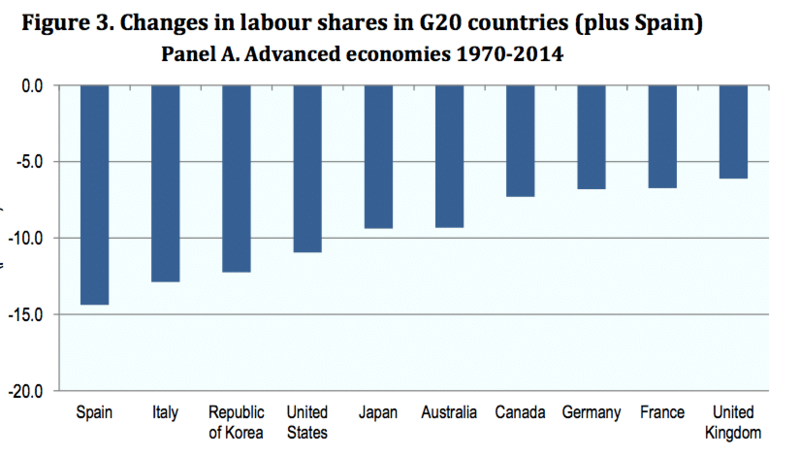 This labour market flexibility makes it harder for workers to demand higher wages. 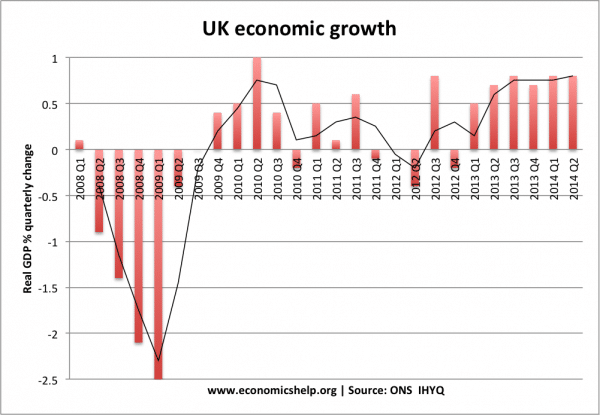 Does it matter if labour share falls? It depends on how it is used. 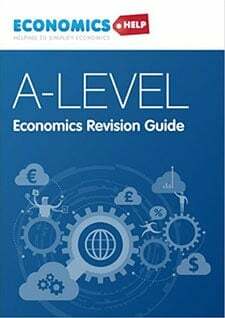 If falling labour share enables increased company investment, then this can enable increased productive capacity in the future and enable rising wages in the future. 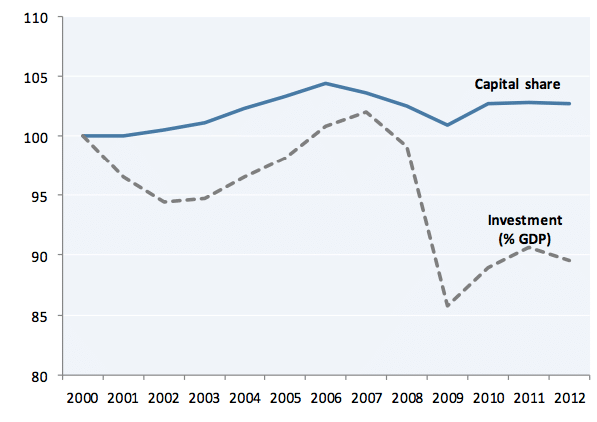 However, in the OECD investment as a share of GDP has not increased in the past decade. Interestingly in emerging economies investment share has risen in same time period. In the case of emerging economies, declining wage share has enabled more investment. Companies especially IT companies have seen a rapid rise in profitability and retained profit. Companies like Apple have cash reserves of over $200bn but are struggling to invest. Substantial sums are also kept in off-shore accounts for tax reasons. Cash reserves. 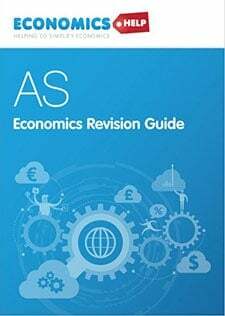 This increased retained profit is worrying in that it implies pareto inefficiency because they are savings which could be used to invest in more productive uses. 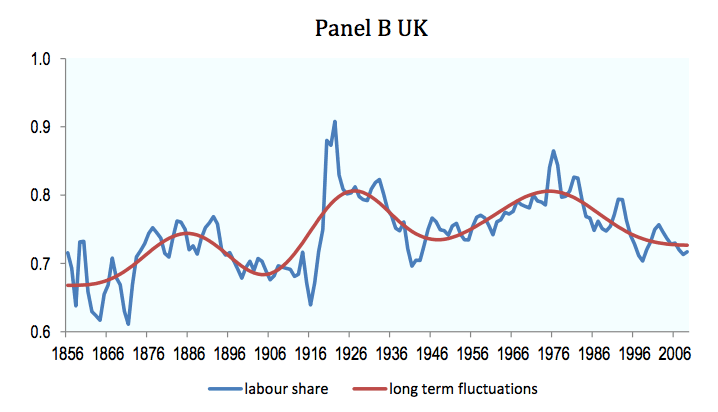 The peak of labour share in the UK was in the 1970s; this was partly caused by powerful unions. However, during this period, there was also many days lost due to industrial unrest – an unproductive situation for the economy.